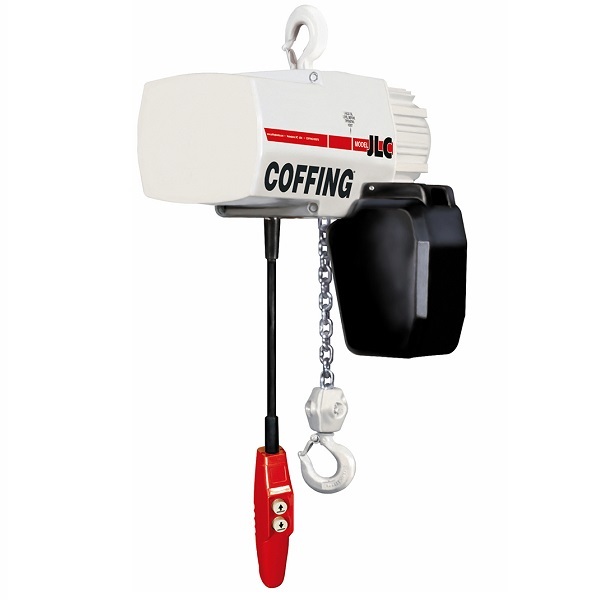 The Coffing JLC chain hoist is designed for industrial duty performance. Its compact size, safety features, and overall reliability make it a great choice for many industrial applications. Standard push button drop is 4-feet less than lift. CSA approved. Limit switches adjustable to regulate upper and lower load travel. Brass nuts standard for improved repeatability and chain positioning. Precision machined alloy steel gears run in oil bath for longer, quieter operation. NEMA 3R push button station ergonomic design fits operator's hand for thumb or two-handed operation. 24 Volt Control for operator safety. 115 Volt Control available upon request. Compact aluminum housing for portability and ease of installation. Chain container standard on lifts up to 20 ft. single chain / 10 ft. double chain.